Yesterday [12 September 2016] saw MAST Asia’s Platinum sponsor, Lockheed Martin produce its first Guided Multiple Launch Rocket System (GMLRS) Alternative Warhead rocket at its Camden, Arkansas, manufacturing facility. The GMLRS Alternative Warhead was designed to engage the same target set and achieve the same area-effects requirement as the old MLRS submunition warheads, but without the lingering danger of unexploded ordnance. Fully compliant with international treaties banning submunition weapons, the GMLRS Alternative Warhead rocket will allow all users of the MLRS to have an area-effects weapon in their inventories without the need to procure additional launcher systems. 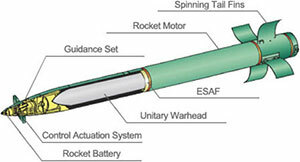 MLRS rockets with submunition warheads ended production approximately six years ago. Lockheed Martin received the initial production contract from the U.S. Army for GMLRS Alternative Warheads in June 2015. Each GMLRS Alternative Warhead rocket will be packaged in an MLRS launch pod and will be fired from the Lockheed Martin HIMARS or M270 family of launchers. Lockheed Martin has produced more than 25,000 GMLRS rockets at its facility in Camden, which has received more than 60 awards over the last decade, including the 2012 Malcolm Baldrige National Quality Award and the Shingo Silver Medallion Award for Operation Excellence.